One of the great challenges associated with beauty blogging is trying to find a pragmatic way to organize and store makeup so that it is easily accessible. My collection never seems to reach a place of stasis, but instead continually grows. One of my favorite ways to store my often-used products is in attractive acrylic cosmetic organizers with separate drawer compartments. 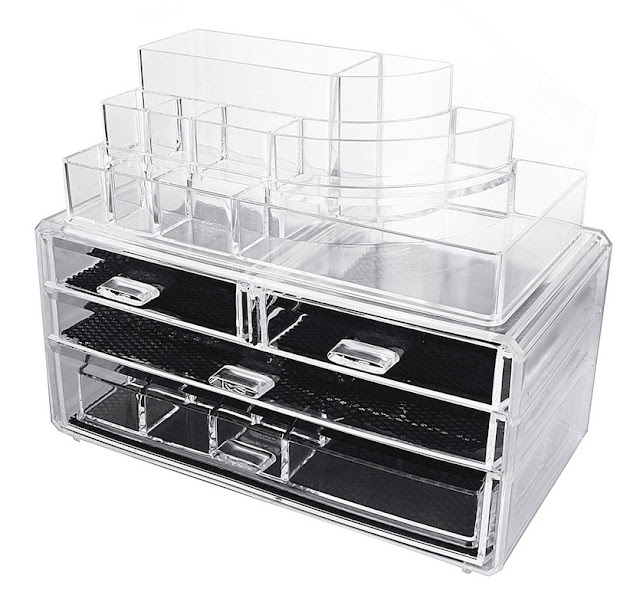 My latest discovery, in this realm, is the MelodySusie Large Acrylic Cosmetic Organizer, and not only is it attractive and sturdy, but it also holds a remarkable amount of makeup. Add to this that it is unbelievably affordable– particularly given its size and quality– and you have a definite winner! In the stock photo you can see that the additional detachable organizer is stored in the bottom drawer. You can leave it in the drawer, or you can remove it and store larger items that would exceed the height of the drawer. If you are using this to store jewelry, then the organizer in the bottom drawer offers the perfect way to store jewelry. The MelodySusie Large Acrylic Cosmetics Organizer consists of three piece: The main unit with three removable drawers, the upper case storage unit and the inner case unit that fits in the deep bottom drawer. The main unit with drawers is about 11 inches wide x 5 1/2 inches tall x 5 1/2 inches deep. The clear...acrylic material as well as the special design allows you to see each objects inside clearly, which also allows you to save more time finding your favorite things when you do not remember where you put it last time! Each drawer includes removable black mesh that prevents everything from moving around, and prevents scratches from forming on the clear acrylic. I removed the divider unit from the bottom drawer and placed on top of the main until, and then filled the taller unit with more makeup and placed it next to the main unit. I filled the top storage unit with often reached for eyeshadows, blushes and a few more lipsticks that I reach for all of the time. As you can see, a great deal is able to be stored in this 10 compartment storage unit. There are 10 compartments in this taller unit as well, and as you can clearly see it has an impressive capacity. The products that I chose to feature in this section were largely selected to give you a sense of the scale of items that can be stored here. The Deborah Lippmann polishes are deluxe samples rather than full size bottles, and they fit into their slots perfectly. The two small drawers at the top of the organizer actually fit a lot of makeup. This slim profile drawer easily accommodates 11 full size Tom Ford Lip Colors, 2 Tom Ford Lips & Boys Lip Colors and 6 Burberry Lipsticks. There is even room left behind the Burberry Lipsticks that could accommodate numerous lip liners. The bottom drawer is so spacious that it effortlessly accommodates the 41 full size lip glosses that I placed in there! Believe it or not, there was still some room left over! Below you can see just how much I stored in the MelodySusie Large Acrylic Cosmetics Organizer. I pulled the two top drawers out so as not to obscure your view in this bottom picture. Overall Assessment: I'm thoroughly impressed that the MelodySusie Large Acrylic Cosmetics Organizer was able to house this much makeup! 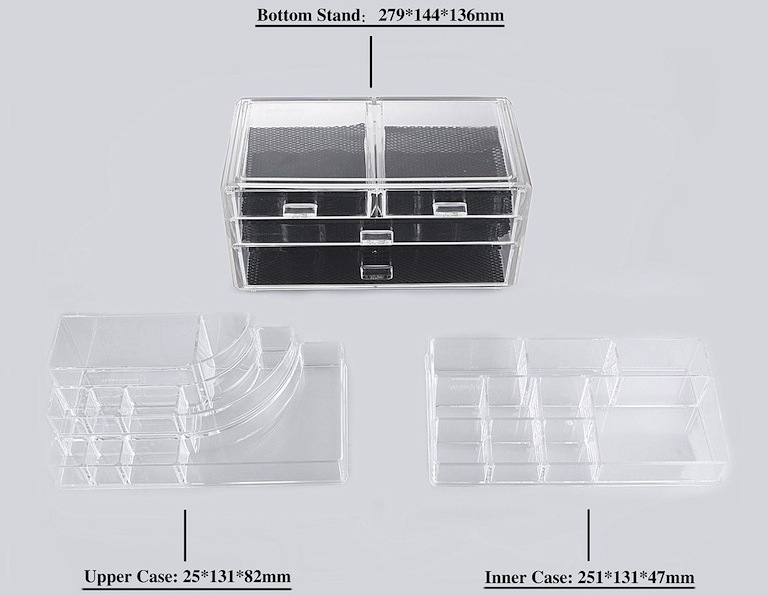 It is a very sturdy, well-made and attractive acrylic organizer. It isn't large enough to house all of my makeup, but then I have amassed a rather large collection. Ideally I could use a couple more, and then I could have one devoted to lip products, another dedicated to eyeshadows, and one for my blushes. If you are looking to add some order to your collection of makeup, then this is a great option at an affordable price. $49.99 PLUS Free Shipping from the MelodySusie Amazon Store and $47.99 from www.melodysusie.com (Suggested Retail $97.99) (Affiliate Links). This case looks awesome! In the first couple of pictures, I didn't think much would fit in it but omgosh! It's kind of crazy how much it holds! Hi Tashina! That was my exact reaction when I unpacked it! I kept think that there was absolutely no way that I could fit very much in it, but I just kept adding more and more and more, and honestly I still can't believe how much stuff I packed in there! For all that storage, less than $50 is a good price! I desperately need something like this! I agree completely, Allison! I highly recommend this one! It's not as big as the colossal ones on the market, but it's also a lot less expensive! You can clearly see how much stuff I managed to get in there, and while it doesn't store everything that I have– it does a great job storing a tremendous amount! Is this makeup heaven? Your collection is stunning! I'm still here my sweets. The movers came on Friday but I'll be here until next Monday. I tried the mud mask by Cleopatra's Choice. You are right. I'm allergic to it. I'm sick of my Glam Glow ones (all of them, really). I'll try the Charlotte Tilbury's next week and see if my face agrees with it. Happy Tuesday my dear. Wow, are staying in an empty house for more than a week? Are you driving or flying? I hope that your trip to your new home is wonderful! Wow! You can fit so much in there! Crazy, isn't it! This is so worth having! Wow, what a great case for storage! I totally agree! You can pack so much stuff in there too! Twinsy, your makeup collection mirrors mine. I bet if we live near each other, it's going to be FUNNNNN!!!! I'm not at all surprised, and I didn't even show any of my Guerlain goodies! My beloved Twinsy, if we lived close to each other not only would we be playing in each other's makeup all of the time, but we would also be enabling lots of additional spending with all too shopping frequent trips! LOL!!!! It really is! I love acrylic storage as well! It makes it so easy to see what you have! Incredible what you can fit in there. The price is so reasonable too. I'd love a Tom Ford lipstick drawer like that. If I can make room on my counter I'll buy one for my overload. It really is. I actually continue to be shocked that I was able to fit that much stuff in there! Yeah, that Tom Ford Lip Color drawer looks a little crazy when you see that many lipsticks together! I highly recommend this storage unit, if you have space for it! This is awesome!! I totally need like one or 2 of these!! I completely agree, Kristina! I definitely would love to have another one or two! I have a similar unit (although, yours looks a little bigger) and love it! I'm so glad that you have something like this! It's such an easy and accessible way to store makeup! WOW - it fits a lot of stuff in there for the price, I think it's great. Isn't it crazy how much stuff I was able to fit in there?!!!!!! I'm super happy with it! I think that I need one or two more! Well, that went on my Amazon list. I need more storage. This should help. Yeah, and I'm drooling over your collection. Niiiice!